Anthony Haynes writes: Some years ago we featured a useful tool for discovering good content on human resource management. It was Humane, Resourced, an ebook edited by David D’Souza and made available free of charge on Kindle. The book provided tasters from dozens of blogs on HR. 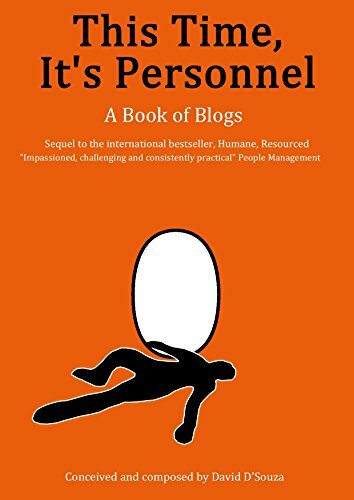 Since then, D’Souza has published a sequel: This time it’s personnel, also available freely on Kindle. Again, the book provides tasters from dozens of blogs. The contents are wide-ranging, including such topics as diversity, inclusion, change, learning, development, and leadership. As in the previous book, one of my favourite entries is written by Simon Heath (@simonheath1). in a chapter called ‘Twenty five’, Heath considers the contents of management books. He notes that often, on reaching the end of such books, we might think, ‘Damn right! But didn’t we know that already’. On this basis Heath attempts to distil the typical messages from management books down to ten principles, each conveyed in a snippet. It seems to me the chapter operates on Dr Johnson’s principle that people need more frequently to be reminded than informed: the messages that Heath identifies are well-known, yet we’re permanently in danger of forgetting them.